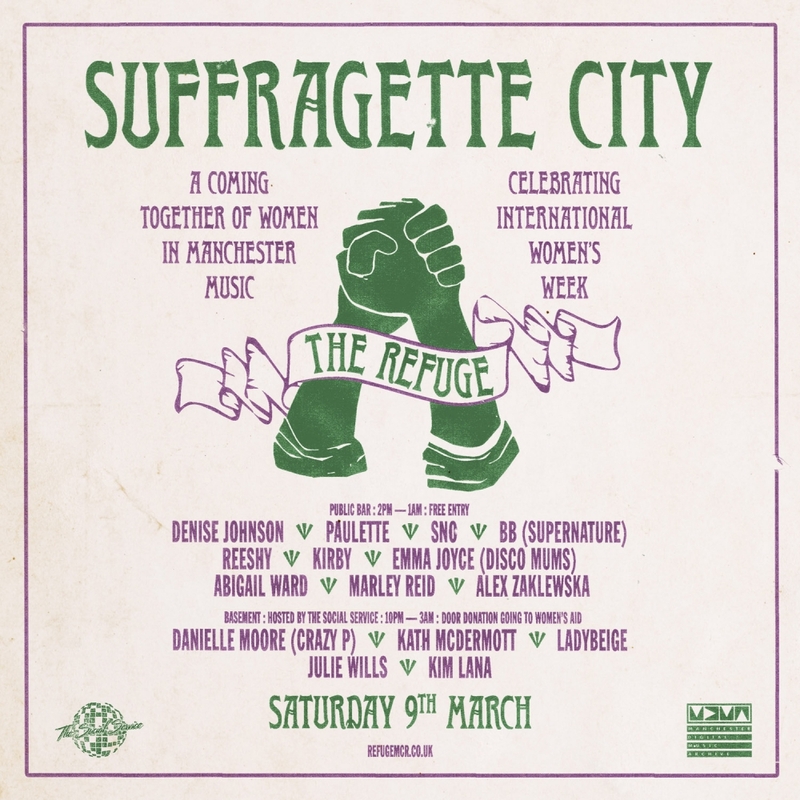 After the resounding success of our Suffragette City exhibition and party in 2018, which paid homage to women’s achievements in Manchester music, The Refuge will host Suffragette City, The Sequel, on Saturday 9th March 2019, the day after International Women’s Day. Suffragette City will feature a collection of spectacular talent, with female DJs taking over two floors for an unforgettable party. Curated by Manchester Digital Music Archive co-founder Abigail Ward, The Social Service head honcho Rina Ladybeige, BBC 6 Music's Kath McDermott and Electrik’s resident Chris Massey, the party will showcase a line-up of established and emerging female musical souls, playing multi-genre party starters in the basement and public bar. Co-founder of MDMA, Abigail Ward said: “We want to build on the phenomenal success of last year’s Suffragette City party by putting together a fresh line-up of female DJ talent, whilst raising awareness of the barriers women can face in the music industry. We are also fundraising for Women’s Aid, because we are keenly aware of the dwindling number of women’s refuges in the UK”. The Refuge Public Bar will host Love Is The Message, from 2pm until 1am, with free entry and no tickets required. Dance the weekend away with powerful sets from Denise Johnson (ACR), DJ Paulette, SNO, BB (Supernature Disco), Reeshy, Kirby, Emma Joyce (Disco Mums), Abigail Ward (Manchester Digital Music Archive), Marley Reid and Alex Zalewska. The Refuge Basement will host Move Ya Body, presented by The Social Service from 10pm until 4am. Proudly supporting Women’s Aid, the admission will be by donation only, with a minimum of £2 at the door, no tickets required. The sound will be provided by legendary disco queens Danielle Moore (Crazy P), Kath McDermott (Flesh/Homo Electric), Rina Ladybeige, Julie Wills (Disco Mums) and Kim Lana.